I discovered that I have a slight obsession with Pretzels on our recent visit to Berlin, where I bought many delicious chewy pretzels the size of my head. I really rather enjoyed Berlin, my first venture into German cusine! Traditionally Preztels are a savoury German snack, dipped in a rather caustic solution of lye to achieve the dark brown coating with the distinctive chewy texture. In amongst the Curry Wursts, Strudels and Pork Knuckle I filled my self up on pretzels as often as I could. We explored the historic sites and the bohemian avenues in the post Christmas and wedding drizzle. Berlin was a very welcome change of scenery, with pickled herring and salmon for breakfast. I went all in with the Germanic food. My instagram feed became awash with a vast array of wonderful and interesting food. Nothing went undocumented! 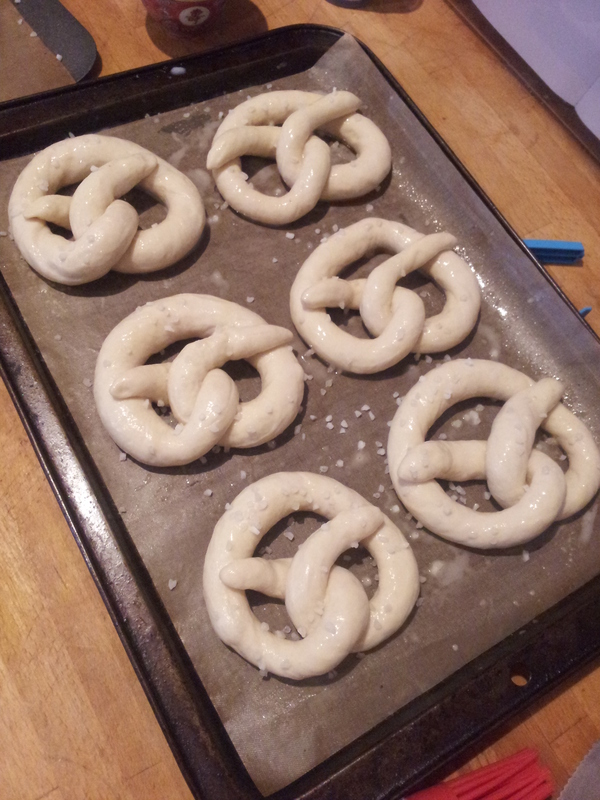 Upon returning home I wanted to recreate some pretzel perfection, preferably without the hazardous solutions. No chemical burns for me please! Pretzels are made from a basic soft white bread dough recipe. The flour, yeast, oil and water should be mixed together in a big bowl until it can then be kneaded on a oiled board for 10 minutes. 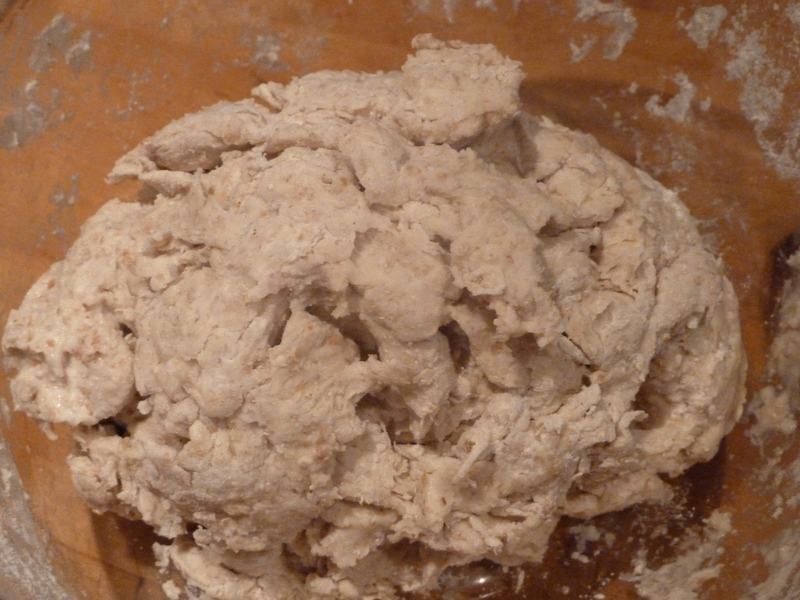 Once the dough is smooth and bounces back when pressed your kneading is done. 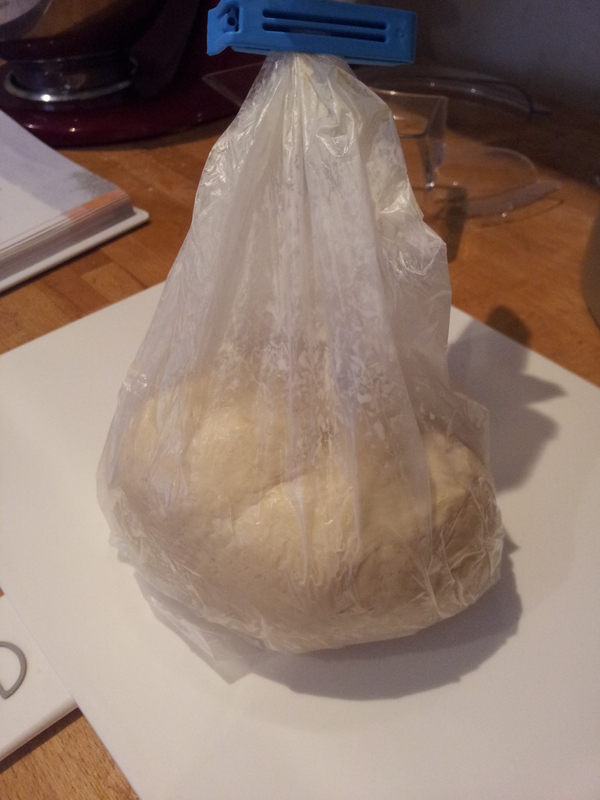 The dough can then be left to prove in a warm place in a greased plastic bag, for about an hour or two. 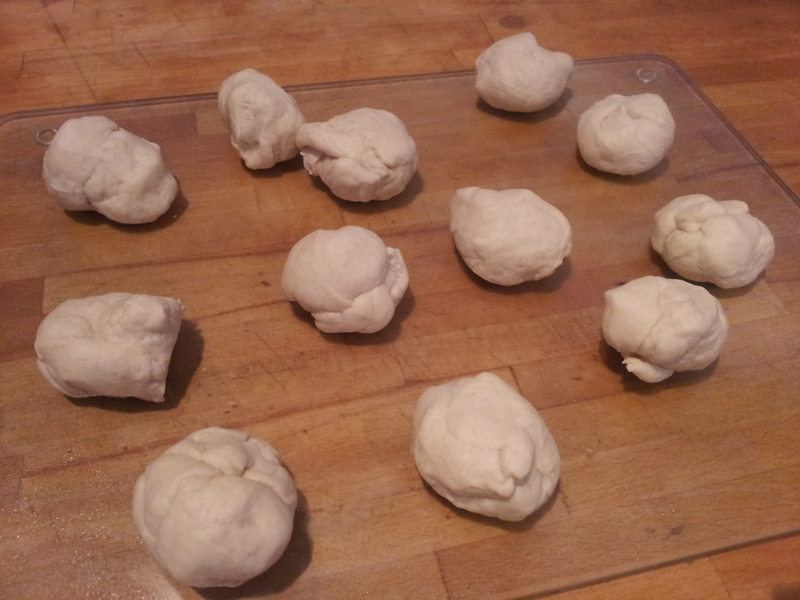 Stage 2: Roll your 12 pieces into balls (check that they’re all roughly the same size). 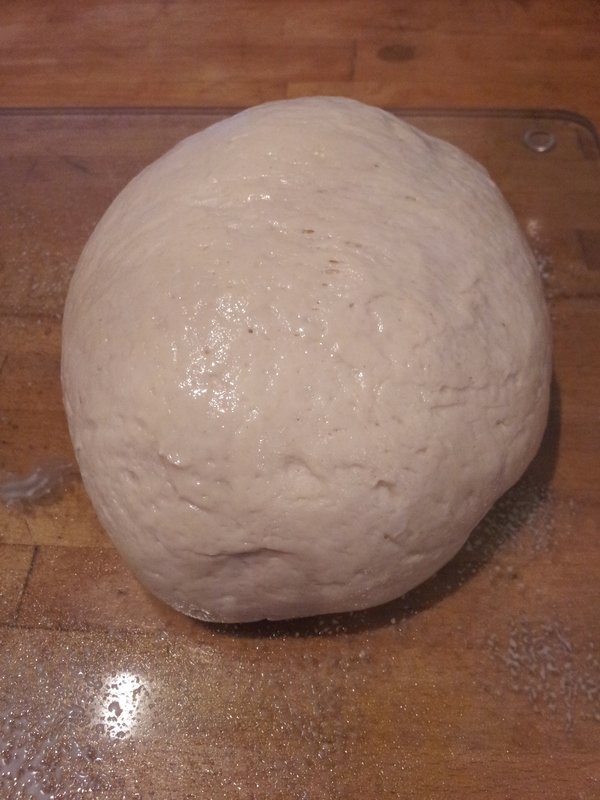 Redistribute the dough to make sure you have equal sized dough balls here if needed. Stage 3: Take one dough ball at a time leaving the others covered with cling film in a greased bowl to stop them drying out. 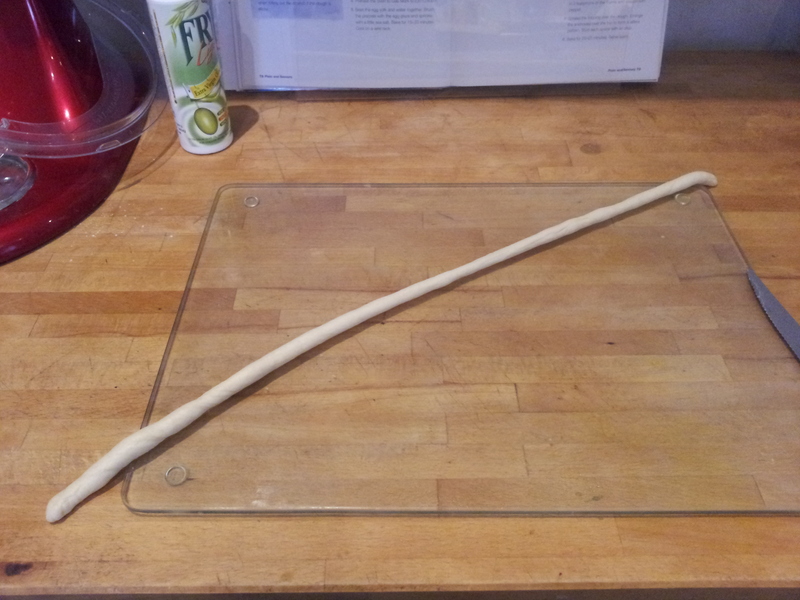 Roll your dough into the longest thinnest sausage you can make. Give the dough a good slap if you spot any air bubbles along the way. 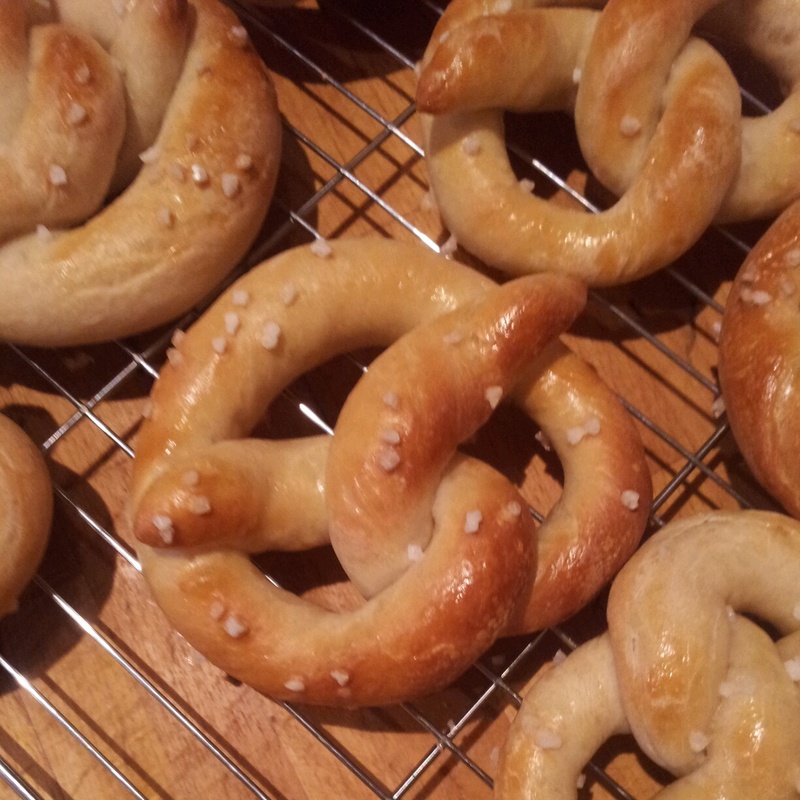 You need to pop any air bubbles to get a good even bake and to maintain your lovely pretzel shape. Stage 4. Start shaping you sausage. 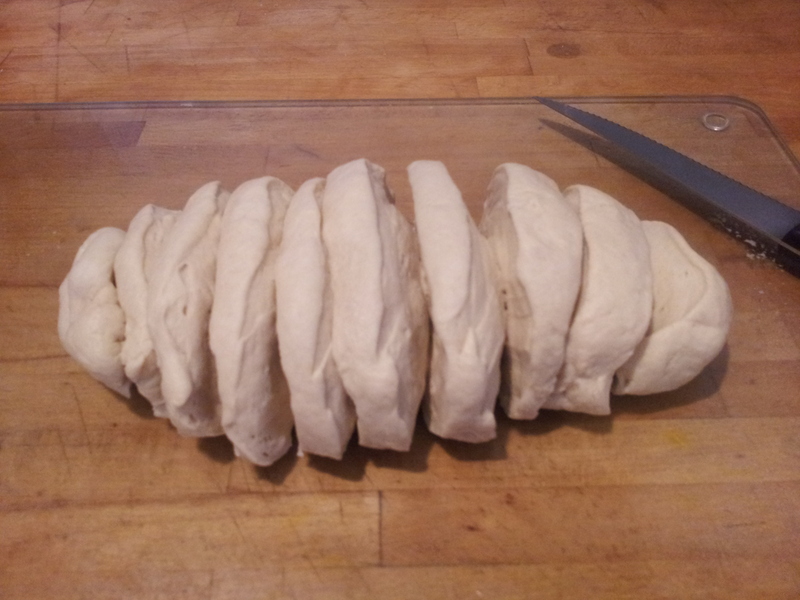 Curl the dough into a semi circle but don’t close the ends. Stage 4: Start shaping your sausage. 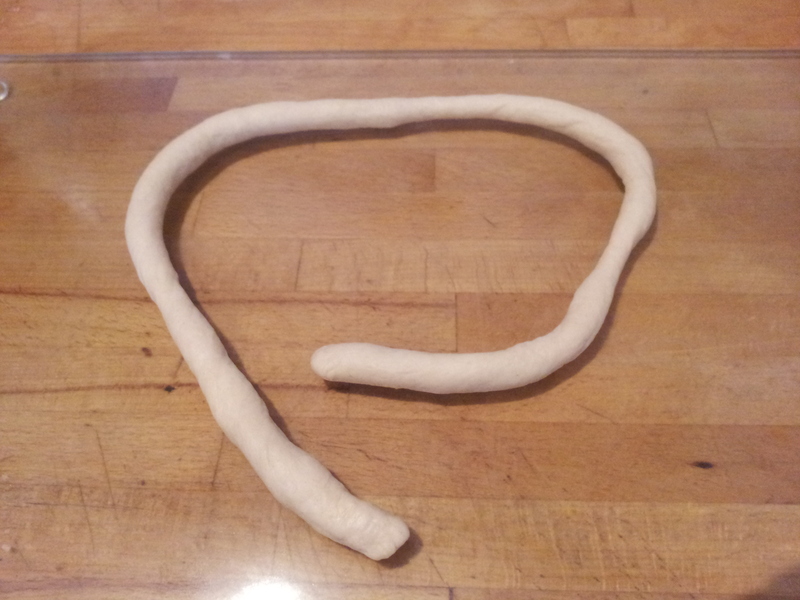 Curl the dough into a semi circle but don’t close the ends. You need those loose ends to finish your pretzel shape. 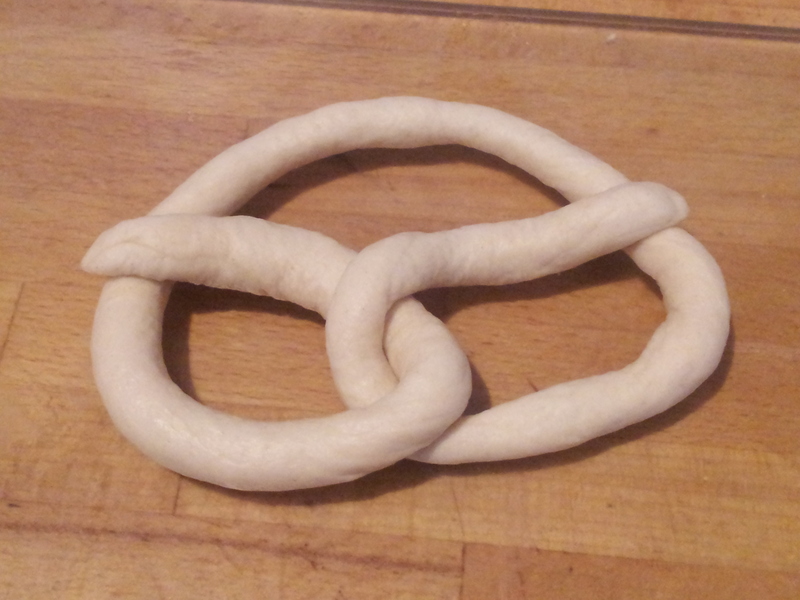 Stage 5: Take the loose ends of the dough and twist the strands together, one under the other up the centre of the pretzel circle. 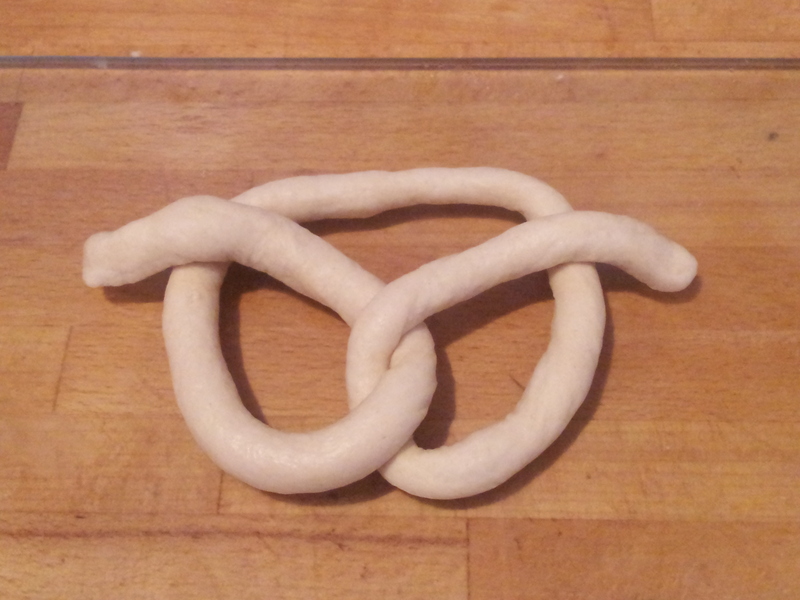 Stage 6: Bring the loose ends two thirds of the way up the sides of the pretzel like arms. 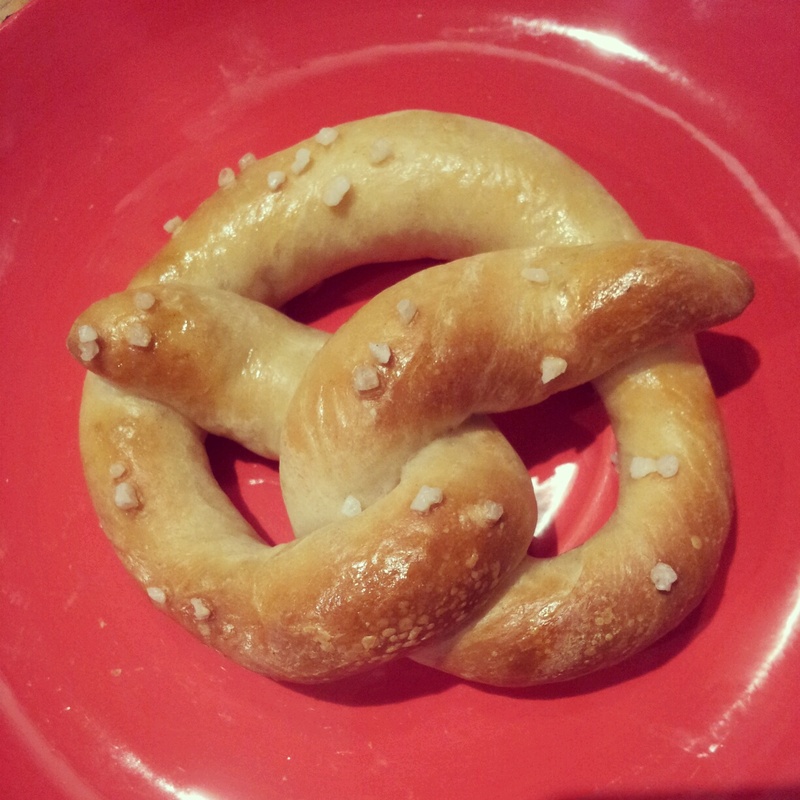 Reshape the circle of the pretzel as you go to keep the even shape. 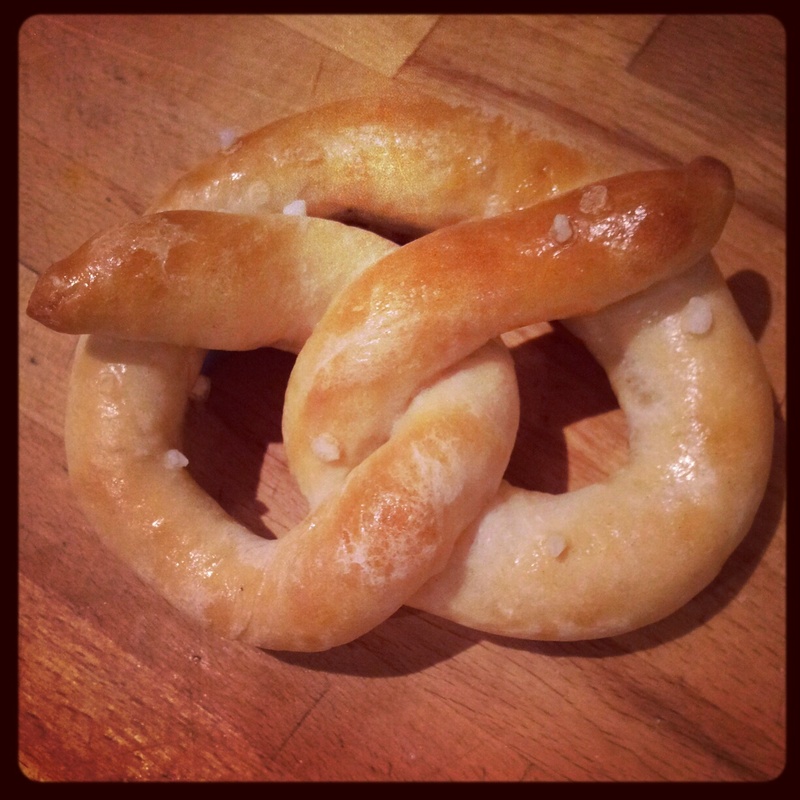 Stage 7: Gently press the ‘arms’ of the pretzel into the dough to fix it in place. 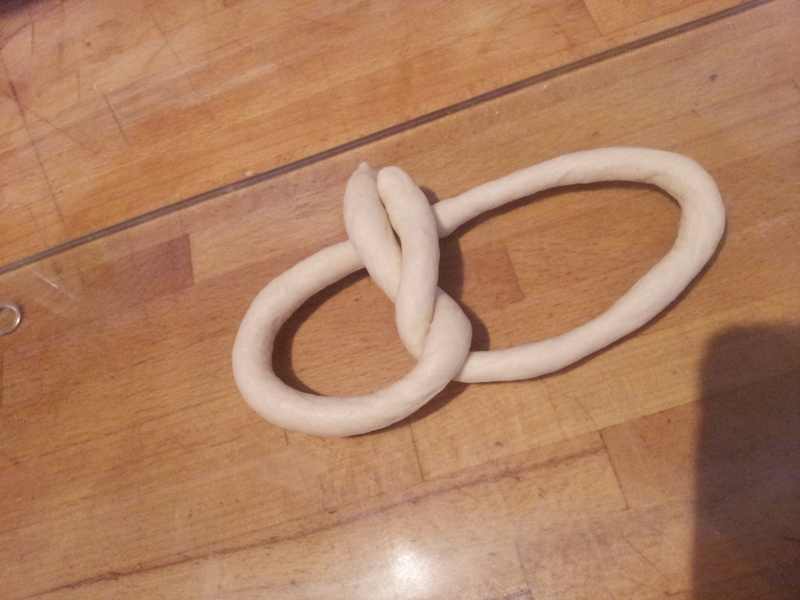 Stage 7: Gently wrap the ‘arms’ of the pretzel around the pretzel. Gently press the arms into the dough to fix them in place. Stage 8: Carefully line up your pretzels on a greased and lined baking tray. Cover them with greased cling film and leave them to prove again for another hour. 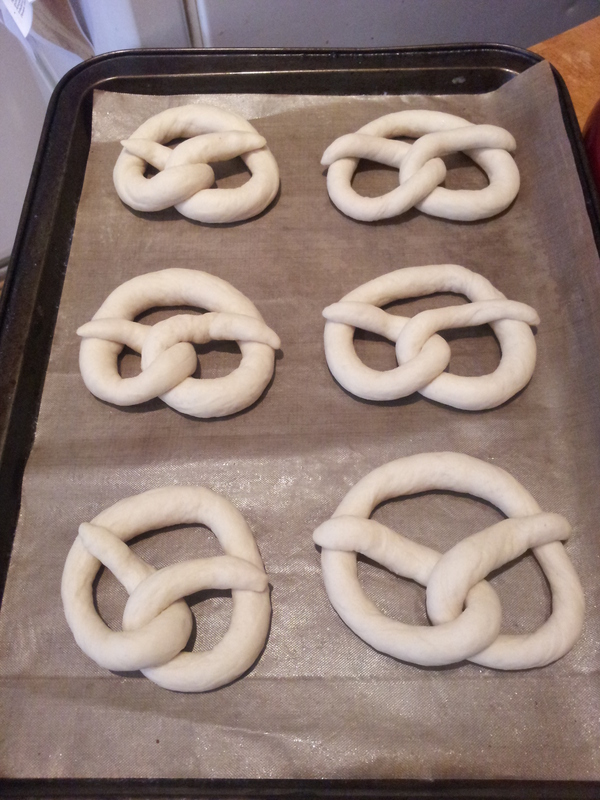 Stage 9: Give each pretzel a good coat of egg wash and water and sprinkle with rock salt before baking. In hindsight I went a bit mad with the rock salt. It kind of burns the tongue when you put that much on! I might in the future smash up the rock salt with a pestle and mortar to get smaller chunks and sprinkle a much smaller amount on! Stage 10: Give the pretzels a good baking in the oven for 15 -20 minutes at 200 degrees C. These are snack sized rather than the extra large pretzels that I was eating in Berlin, which could probably constitute a main meal. So if you wanted to make yours larger you could divide your dough into 6 lumps rather than 12 and shape them to your hearts content. 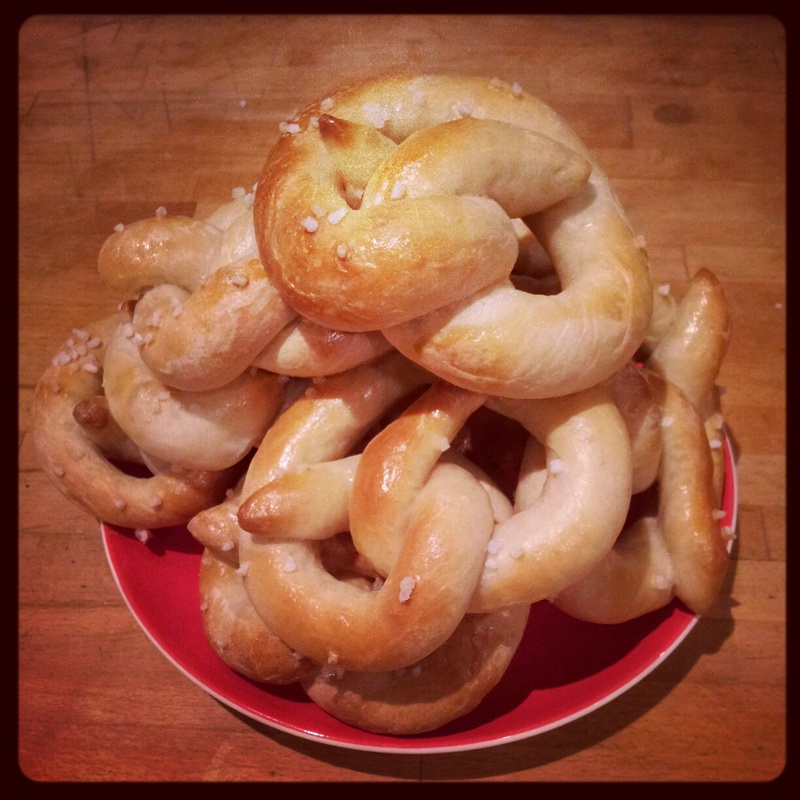 After a quick bake in the oven these mini pretzels beauties are ready to be devoured! The most complicated bit of the entire process is the shaping and after a couple of goes you soon get used to the technique. I’m sure you will end up developing your own pretzel twisting style too. I adore these pretty bread shapes and will most definitely be making them again. They look impressive, so you can wow your friends with your technical know how and let them imagine you’ve spent countless hours in the kitchen preparing treats for them. ← 48. Oh Canada! Oh Nanaimo Bars!